Travelling thousands of miles from home to enter college is the only way nineteen-year-old Avery Morgansten can escape what happened at the Halloween party five years ago—an event that forever changed her life. All she needs to do is make it to her classes on time, make sure the bracelet on her left wrist stays in place, not draw any attention to herself, and maybe—please God—make a few friends, because surely that would be a nice change of pace. The one thing she didn't need and never planned on was capturing the attention of the one guy who could shatter the precarious future she’s building for herself. Avery deliberately chose a college far away from home, one that allowed her to get away from her family and the people she used to consider her friends before the terrible night that changed everything. All she wants is to be able to live her life without being constantly harassed, she wants to stay out of the spotlight and hopefully make a few friends. The last thing she is looking for is a boyfriend, especially not one with a reputation as a player. She meets Cam on her first day after literally running into him, he is absolutely stunning and most of the girls on campus have a crush on him which is a huge reason for Avery to stay far away from him. That isn't quite so easy when she discovers that he is also her neighbour though. Cam is drawn to Avery, there is something about her that makes him want to get to know her and it doesn't matter how many times she turns down his request to go on a date he isn't going to give up. Before she even realises what is happening Cam has started to break through Avery's defences but she is still keeping a huge secret, one that she is scared will make him walk away from her. As her past starts to catch up with her Avery has to decide if she can trust him, not just with her secrets but also with her heart. I'm a huge fan of Jennifer L. Armentrout's Lux series but I hadn't got around to trying any of her adult contemporary romances written under the name of J. Lynn yet. 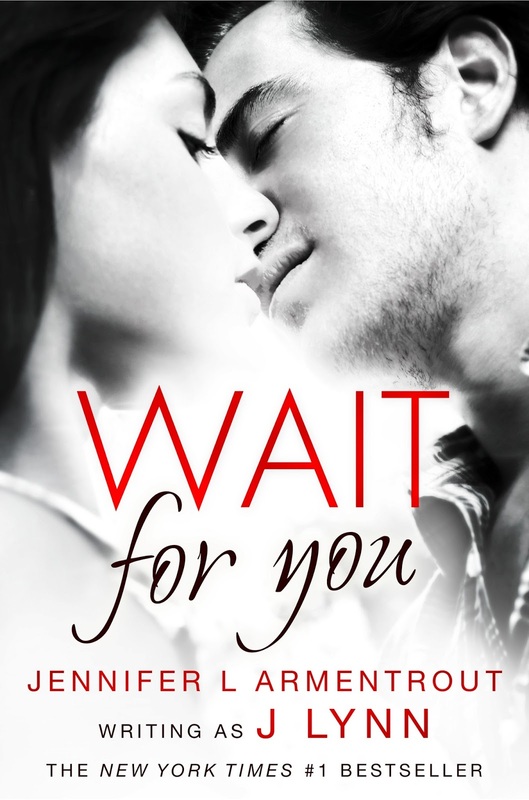 Even so I jumped at the chance of reviewing her first new adult romance Wait for You and I'm so glad I did because I loved it. I've been devouring contemporary romance recently and I'm loving the NA age range as well as adult stories so I had high hopes for this and thankfully I wasn't disappointed. I already knew this author had a knack for writing swoon worthy heroes but she outdid herself with Cam and I fell head over heels! I want to start off by talking about Avery though, she was such a fantastic heroine. Someone who has been through so much and who is still struggling to put the past behind her but she is a survivor, the kind of girl who wants to turn her life around and find a way to be happy. I'm sure a lot of people in her situation would have given up but she is determined to get a fresh start. I found myself absolutely livid at her parents, her mother in particular, for the way they treated her. To think that she had gone through something so horrific and then nobody, not even the people who are supposed to support her unconditionally, believed her was awful. Considering that she has spent years with people bullying her and blaming her for something that was in no way her own fault it isn't surprising that she has trust issues. In spite of that Avery wants to find friendship again, she is a caring person and wants to have people she can share that with even if she does struggle to let people in. I felt that her reactions were incredibly realistic considering everything that had happened to her and I found it incredibly easy to relate to her. Now I've already mentioned how swoon worthy Cam is but I don't think I have the right words to do him justice. He is a cocky bugger but I loved that arrogance and swagger he has about him. He never takes it too far though and makes no apologies for being who he is. Not only is he gorgeous with a body to die for he is also caring, protective, kind and gentle. Even when Avery hasn't opened up to him he can tell that something has happened in her past and he is incredibly patient as he sets about earning her trust. I think a lot of guys would have given up long before Cam does, especially when she constantly rejects his requests to go on a date, but he knows that she needs to get to know him before she will agree and is prepared to put the effort in. I have no idea how Avery managed to resist Cam and his witty banter for as long as she did though, I'd have been swooning all over him long before she was! Besides who can resist a guy who brings them home made treats like cookies and brownies and comes round to cook you breakfast every weekend? One of the things I loved most about this story was the fact that Avery and Cam take time to get to know each other as friends before they jump into a relationship, there is obviously attraction between them from the very first moment but by the time they start dating they genuinely care about each other. I did get a tiny bit frustrated that it took Avery so long to open up to Cam but given her past experiences I really couldn't blame her for that. I don't want to get into the details about what happened to her, you'll have to read the book to find out, but I do think it was sensitively handled and I was pleased with the way things turned out in the end. Wait for You is a fabulous love story, one that tackles dark subjects and that will bring tears to your eyes but also one that will have you laughing out loud one moment and falling head over heels in love the next. I can't wait to carry on reading this series and I'll definitely be picking up some of J. Lynn's adult romances to tide me over while I wait for the next instalment. I haven't actually read any of her books! I might have to check her out, thanks for the recommendation! Great review, I really enjoyed this book too. You can see my review here. @ Cait - I'm so glad to hear you enjoyed this one too!